The Cypher statement below creates the example. Copy the statement to the Cypher panel in InterActor, as described in the first example, and click the [Execute] button. InterActor will process the Cypher and return the interaction diagram. 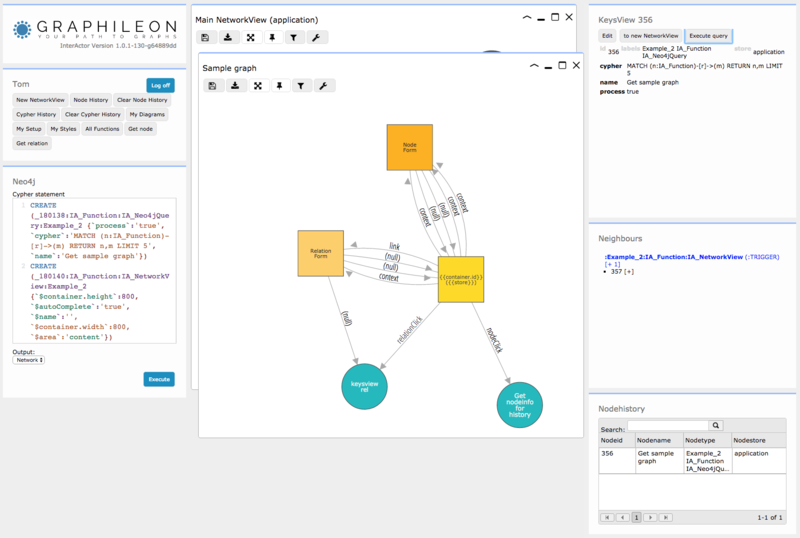 The diagram contains 4 :IA_Neo4jQuery nodes, 1 :IA_NetworkView node and 1 :IA_TableView node. To view the properties of a node or relationship, select it and see how the properties are displayed in the KeysView panel at the top right. This statement will be executed once the :IA_Neo4jQuery node is activated. The :IA_Neo4jQuery node has a process property set to true, to ensure that the Cypher results are available as nodes and relations to the outgoing trigger to the :IA_NetworkView. The trigger with type:success (only executes when the Cypher executes successfully) carries two arrays #nodes and #relations to the :IA_NetworkView node. The :IA_NetworkView node has three outgoing triggers of type:context. With menu:canvas, menu:relation and menu:node you can define in which contextmenu the option is included. Each of these triggers carries a parameter that is used as an input for the subsequent :IA_Neo4jQuery node. All three queries that can be activated from the context-menus send their output to a :IA_TableView. Note that the :IA_Neo4jQuery "Extract similar" also sends output to the :IA_NetworkView. By setting a $container.id property, we can define whether we want to use a specific container. If the container with that name does not exist yet, it will be created. If this property is omitted, InterActor will create new containers every time the function is triggered. To run the example, select the "Get sample graph" :IA_Neo4jQuery node (blue circle) and click the [Execute query] button in the KeysView panel. 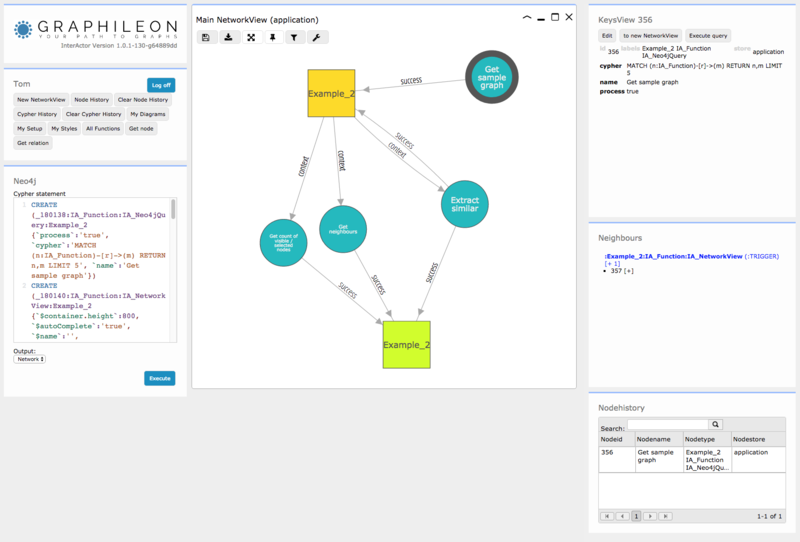 The Cypher in the :IA_Neo4jQuery node is executed and the results are returned in a NetworkView. When you right-click in the "Sample graph" NetworkView on a node , relationship or the canvas, there will be a context-menu. Note that the contextmenu of the canvas also contains two built-in options. You may also wonder why, when you select nodes in the "Sample graph" NetworkView, their properties do not appear in the KeysView panel, while when selecting nodes in the "Main NetworkView (application)" NetworkView, they do appear. The reason is that the required interaction between the "Sample graph" :IA_NetworkView node and the KeysView panel, which is a :IA_HtmlView node, does not yet exist in your instance. The next example illustrates how you can create such an interaction in an efficient way.